Hello Maria, I am very glad that I found your site! Your instructions are very understandable. Question: I'm right-handed and my rear foot comes off the ground during my downswing. My knee goes forward instead of inward. How can I fix this? Hi Luther, Thanks for writing MyGolfInstructor.com. I'm excited to get to help you with your game. You should know that your right foot or rear foot should come up in the downswing, just not too early. You'll want to practice rolling your ankle towards the ground and then rolling up onto your toe. It's the same action your foot would take if you were to pitch a baseball. Your foot should essentially be pulled up by the rotation of your hips towards the target and your weight shift to the target side. When my students have a problem with it coming up too early in the downswing, the first thing I do is have them learn to hit balls keeping it down throughout the entire swing. Note that this is just a drill, but it helps kill the habit of lifting it up. 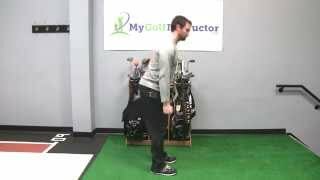 Once that is mastered, then you can practice rolling your ankle down towards the ground - target side and then you should be well on your way to correct foot work in your downswing. In Golf Fitness Tips. Mar 12. 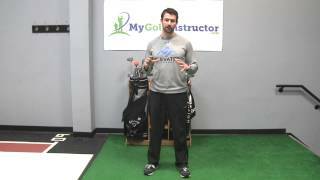 What is the most common injury in golf and how can it be prevented? In Golf Fitness Tips. Feb 19. My putts seem to go right of the hole most of the time..........what am I doing? In Putting Tips. Asked by Mary R. Feb 11. In Golf Fitness Tips. Feb 5. I need to get my swing more consistent. Also, I need to learn how to read greens correctly. Thanks in advance. In Putting Tips. Asked by Andre R. Jan 29. How can I hit low flighted, high spinning pitches with little to no divot? Higher pitches with medium spin are no problem for me. So I have my basic pitch shot. In Chipping Tips. Asked by Marc C. Jan 21. I am inconsistent with my chips and short pitches. Can you offer suggestions? In Chipping Tips. Asked by James N. Dec 19. What is the most important muscle for power in the swing? In Golf Fitness Tips. Nov 21. I have trouble with bunker shots around the green where I have to carry the ball a long distance. What is your advice? In Bunker Tips. Asked by Mike C. Nov 14. In Chipping Tips. Asked by Wyatt B. Oct 3. How do I consistently get out of green side bunker? In Bunker Tips. Asked by Bob M. Sep 26. Hello Maria, I'm a left-handed golfer and my game is all over the place. I swing too quickly and my handicap is too high. My question is: I love using woods because they are heavier and slow my swing down, so I purchased a whole set of hybrids. How is hitting them different then a regular set of clubs? I usually only used my high irons - never the low ones. I don't know if you sweep the club or hit down on it. Thanks for any help! In Hybrid and Wood Tips. Asked by Robin R. Apr 23. Hello, A friend was standing on the edge of a hazard by his cart and his ball was in the hazard. He dropped his club to adjust his glove (club was in hazard) and his opponent assessed a penalty. Is this penalty justified if he wasn't taking a practice swing or near his ball? In Rules of Golf Tips. Asked by Jim D. Apr 20. In Diagnosing Problem Tips. Asked by Travis C. Apr 17. Im 57 years old and use to play a great deal of golf my lowest handicap was around 5 I haven't played in a long time my question is are oversized headed clubs that much easier to hit I use to play with Ping red dot do you have a brand taht you really like. In Equipment Tips. Asked by Sam C. Mar 21. I have never played. I am 5'9" and an athlete. Should I get a beginners set for men or women? In Equipment Tips. Asked by Rose K. Mar 12.